A Little Electrical Trick Anyone Can Do! something a little different. Ahhhhh--- Got your attention !!!!! 30 amp breaker, and there was some receptacles beside it. the power of pop up camping !! the 30 amp line. Now I have two plug ins !! 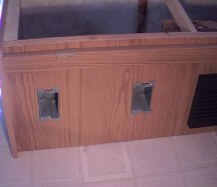 A 30 amp and a 20 amp. 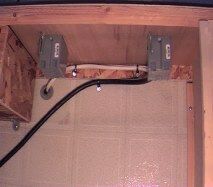 90 degree connectors to protect the wiring. weather. 2 feet of snow and a low temperature of 2 degrees!! Do not try to run a heater and water heater with this install. The circuit will not carry both. This is the reason for the switch. When the switch light is on the water heater is on. 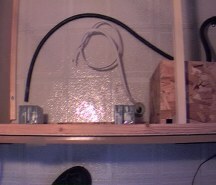 Wiring completed. 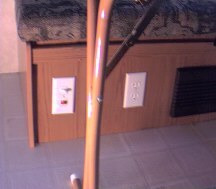 Notice wiring going tru the floor to feed outlet in storage area. Neat and very useful ! !